Never heard of Tour Edge? Tour Edge Putters seem to be pretty new to the market, but in fact they've been around a little longer than you might think. The company was formed in 1985 and their putters are generally in the more "affordable" category. They also make a complete selection iron sets, drivers, fairway woods and hybrids and a line of stand or cart golf bags. Tour Edge putters have been used by a number of touring professionals. Most notable is the Japanese JLPGA player Ryu Ritsuko, who had a standout season in 2012 with two wins and impressive birdie barrages to finish both tournaments using her Tour Edge. Which are their top designs? Tour Edge makes several distinctly different putter designs, each available in traditional black, and many in trendy white finishes. Tour Edge putters range from $39.99 for the Backdraft GT to $219.99 for the tour-inspired DG Tour Proto. The putter Tour Edge is most famous for is the unmistakably unique T-Balance Putter, designed by Tour Edge founder David Glod. It features a patented 90 degree bend shaft which attaches into the back of the putter and delivers a very different feel similar to the Odyssey Backstryke. The bent portion of the T-Balance shaft is specially strengthened in an attempt to minimise the “twisting effect” on an off-center hit. There is also a stability bar provides more weight behind the sweet spot, thus creating high MOI (moment of inertia). 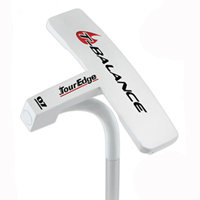 The heavy head design also make the T-Balance putter good for belly or long putter applications. This putter is street priced at $119.99. Is Tour Edge simply a budget brand? Not anymore! Seemingly inspired by the PGA tour-popular (and more pricey) Scotty Cameron putters, Tour Edge have introduced the Exotics DG (David Glod) Tour Proto line. These are high-spec milled putters in Anser, Zing or heel-and-toe blade shapes for players who don't mind spending over $200 for their "flat stick". The Tour Proto is a classic design milled from a solid block of stainless steel, which gives it good feel. 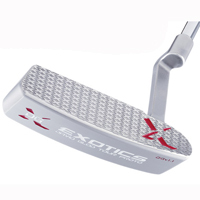 This putter comes with a patent-pending multi-level X-grip face pattern, which like all putter face grooves, is designed to give a fast roll off the club face and reduce skidding of the ball on the green which can push the ball off line. Whether you would pay $200 plus for this putter is a tough decision. After all, at that price, you're in Scotty Cameron, TaylorMade and Odyssey territory, all of which have bigger reputations and more experience at making top level putters. Tour Edge runs demo days! You can test the entire line of Tour Edge putters at demo days they hold around the country. Visit: www.touredge.com/services/demodays.asp for the location and date of a demo day nearest you. Tour Edge offers demo day discounts of $10-$30 on some of their equipment, so you might be able to benefit from that. They also offer a 30-day money-back guarantee on all products, provided they are returned in "playable" condition. For more information on Tour Edge Products, click here. Not sure whether Tour Edge Putters would suit your game? Click here for Best-Putter.com's guide to choosing the right putter for your stroke!